When you think of bullying what’s the first thing that comes to mind? Maybe it’s a group of kids pushing someone around on the playground, or Mean Girls in high school spreading rumours behind your back. You probably didn’t picture bullies in your dorm room or in the lecture halls at Ryerson. But that doesn’t mean bullying stops after high school. A new study out of Indiana State University, recently found that 15 per cent of college and university students say they have been bullied, with 22 per cent reporting cyber bullying. The study attempts to address the lack of research on bullying at the post-secondary level. Its findings also revealed that 38 per cent of university students reported knowing someone who’s been bullied with nine per cent reporting they had cyber bullied someone themselves. What does this all mean? If bullying is common at places like universities, in what ways does it present itself and how does it affect student life? Luke Williams, a second-year Ryerson student faced cyber-bullying on social media websites earlier this semester. Although he said he’s faced bullying in the past in high school and elementary school, being the target of adult bullying left a different sort of sting. “It was like a hammer to the heart,” says Williams, whose bullies created fake accounts that impersonated him on social media websites. Experts suggests not to respond to online cruelty, instead to ignore or block individuals that are hurting you. If the bullying escalates, you are entitled to contact the police and press charges. Williams’ bullying case is currently being investigated by police. He says he’s moved on from the incident but offers advice for students in the same situation: to report what’s happening and confide in friends or someone you trust for support. “My family was hosting its Thanksgiving party that weekend and supported me by just setting the incident aside and giving thanks for what we had that really helped,” he said. Kudos to Luke for sharing his story – it’s important for bullying victims to come forward so we can do something about it. There is an awesome group of Ryerson students who are doing just that. Team Up Against Bullying with the Ryerson Rams has been spreading the love through an anti-bullying outreach program. Over 300 Toronto middle-schoolers visited our own Mattamy Athletic Centre last Wednesday to hear from the Ryerson Rams and the Toronto Police Services in a day of motivation and sharing to raise awareness about bullying. Ivan Joseph, director of athletics says that Ryerson Rams have an obligation to serve as positive role models and mentors, and I couldn’t agree more. So what can we take away from the Ryerson Rams as a lesson on bullying awareness? We can be role models – Think of a young person in your life. It might be a little brother or sister, a cousin or friend of a friend of a friend. You can help stop bullies by talking to them about what being nice really means. If you don’t know anyone younger, reach out to someone at school who is having trouble making friends. Make a pledge to not be a bystander. The bullying cycle involves the bully, the target of bullying and the bystander. 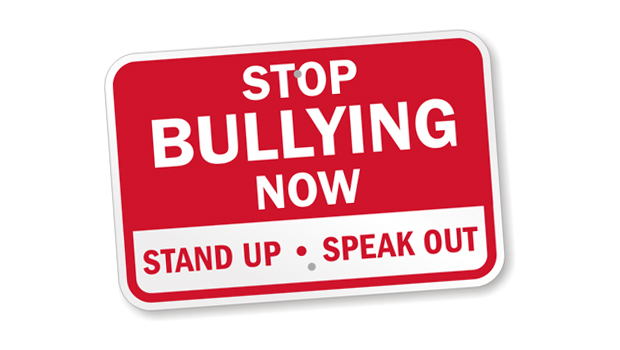 Bystanders play an important role by either stopping the bullying or encouraging it to continue. By doing nothing, the bullies continue their behaviour. More than 85 per cent of bullying incidents are witnessed by other students yet studies show that bystanders only intervene 11- 22 per cent of the time. Bystanders can prevent bullying by confidently speaking out against bullying when it’s happening, and by being inclusive to a person who gets bullied. So make a pledge to stop and confront bullying if you see it taking place on campus or beyond. You can also learn more by attending Ryerson’s guest lecture on bullying with renowned author and bullying expert Barbara Coloroso, at the Ted Rogers Theatre (7 p.m Tues Nov 20.) Colorsoro will be discussing themes from her new book “The Bully, The Bullied and The Bystander” along with an expert panel to weigh in on the issue. This event is also part of the 100th Grey Cup Festival which is devoting an entire day to end bullying at Yonge-Dundas Square. Students across the GTA will be taking part in a giant anti-bullying rally at 10 a.m. on Tuesday November 20, so take a walk over and check out the action. Previous ArticleJustine Chiu: Working with Hues and Human ResourcesNext ArticleWhat happened to falling head over heels with your secret admirer, who ends up being prince charming?